After the expense of buying an awning, you will need to think about awning care to keep it looking good and giving you many years of good service. The best way to clean the awning is when you have erected it on the caravan so that you can reach all the sides plus the roof with a step ladder. Only use just warm water with a soft brush. Anything stronger (even just washing-up liquid) could remove the waterproofing or damage the canvas. Don't use a pressure washer as this may also cause damage, not only to the canvas but also to the seams. Only clean the awning when it is completely dry. Sometimes just brushing off mud or bird poo when it has dried is better than wetting the canvas and then trying to get it off. If warm water doesn't remove the stains, you may have to buy a specialist awning cleaner. If you do have to buy some always try it first on an inconspicuous area of the awning just in case it marks the canvas. The most important point to remember when storing your awning is to always pack it away when it is completely dry. If it is wet, or even just damp, when you take down your awning you must dry it out completely at home to prevent any mildew forming. The poles must also be completely dry before storing to prevent rust. Fibreglass poles only need to be wiped with a damp cloth. Steel or aluminium poles should be wiped once a year with either silicone or wax polish which will help to prevent any rust. When you are not using your awning store it in a dry, aired place. 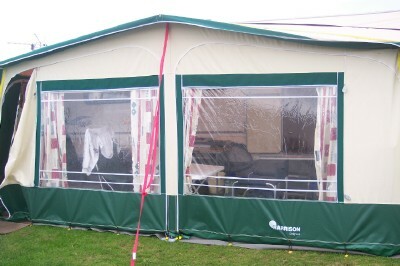 Don't leave the awning in your caravan over winter just in case any condensation forms in your caravan. The best place is a cool and dry garage. You will soon know if your caravan awning needs reproofing - you will get wet if you sit in it during the rain! There are many specialist reproofing products on the market which you can use yourself. If most of your awning needs reproofing it is easiest to do it while the awning is erected. Don't use a spray reproofing product on a windy day. You must not use a reproofing product in boiling hot sun as the product will dry before it has time to soak into the canvas. Remember, reproofing products are extremely flammable until they are dry, so no flames near it or smoking while you are using it! Make sure your awning is clean before reproofing. If you can't get the outside clean enough you could always reproof the inside of the awning. Always make sure your awning is completely dry after reproofing and before packing it away. If you have any awning care tips we have not mentioned, please let us know. An awning is one of the most useful pieces of kit a caravanner can buy. Therefore, awning care is very important, especially if you have purchased a really expensive one. If you look after your awning it will give you years of good service. Remember, it is always worth looking around for a used awning which will be cheaper than a new one. Just check a cheap awnings condition before buying and check it will fit your caravan!